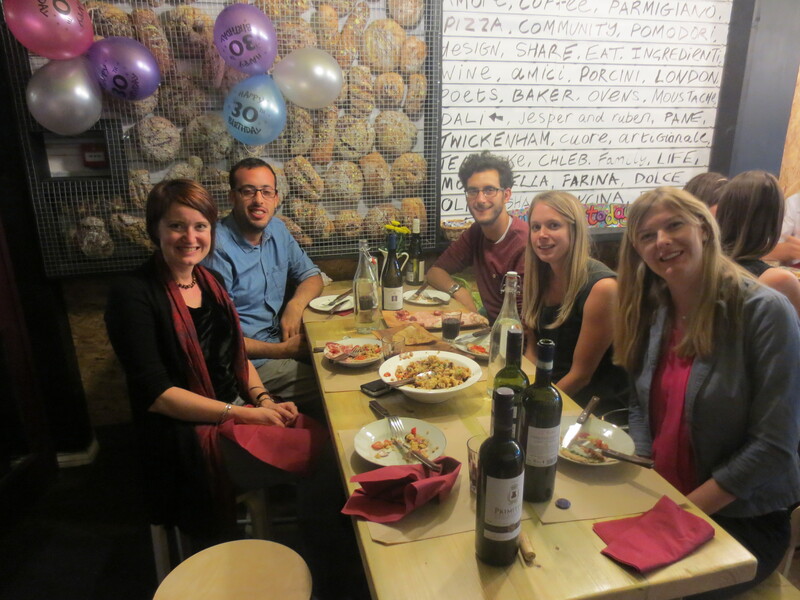 My son’s 30th birthday celebrations continued at Ruben’s Refettorio last night. 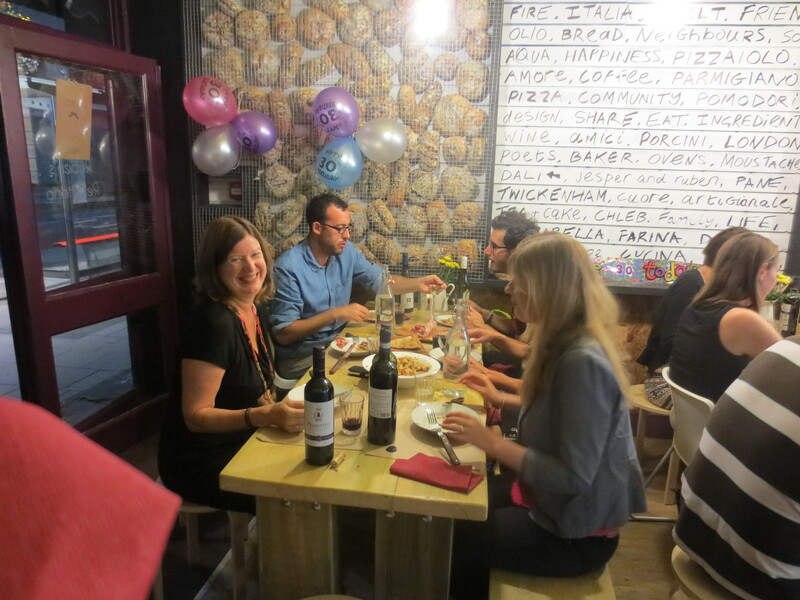 Igor’s wonderful bakery and pizzeria have become such family favourites that when Jonathan was deciding where to gather his friends to celebrate his entry into a new decade, it was a natural choice. Some of us had built up an appetite on the playing fields of Old Deer Park in the afternoon with a sports day organised by the teachers amongst us, Lyndsey and Liz. 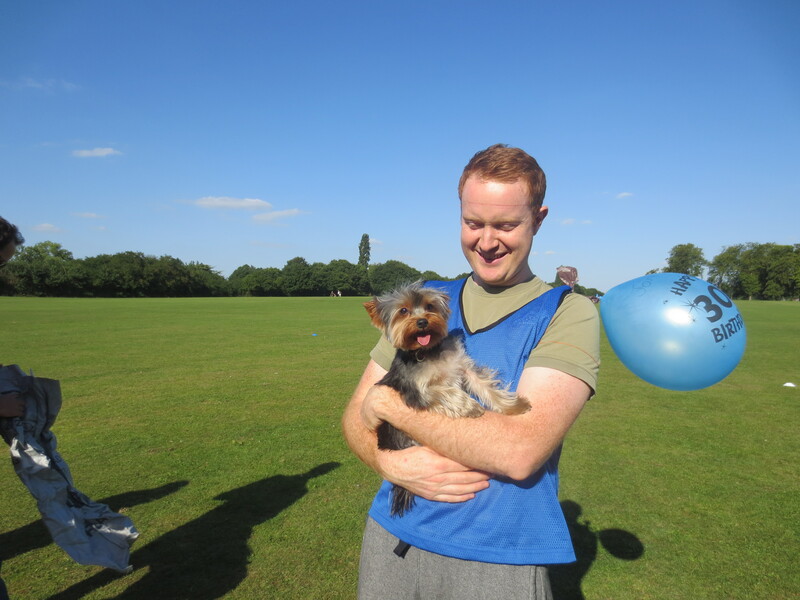 Zeph, Jonathan and Lyndsey’s Yorkshire terrier, would have won all the races on the basis of speed had he been allowed to officially join in and could understand the rules. He was however worn out enough not to complain when we left him later on to go off to Ruben’s. At Ruben’s we pretty much took over the place. Early diners had left or were leaving and we all sat down a little after 8.30. The great thing about the informality at the Refettorio is that we could be constantly on the move. Jonathan had a stool that he moved from table to table, able to spend time with each of his guests. In between courses it was easy for us all to change tables, wander over to another and chat to different people, but once food was put down everyone was keen to tuck in. Jonathan had agreed a set-price menu with Igor and we began with three large plates of antipasti: panzanella (an Italian bread salad) which smelled wonderful as it was laid on the table and tasted equally good; a selection of Italian meats and some bruschetta with home-made rocket pesto and tomato. 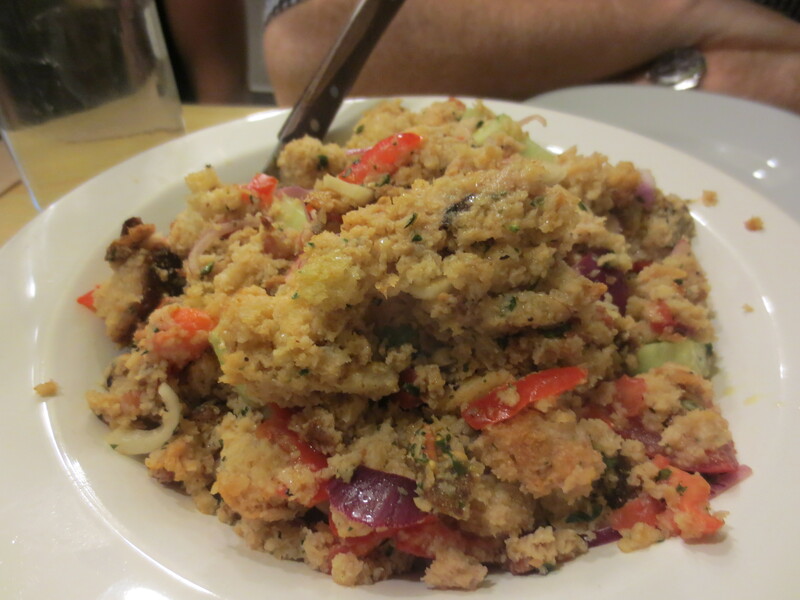 The dough for the bruschetta was a tasty combination of spelt, wholewheat and rye and really good. 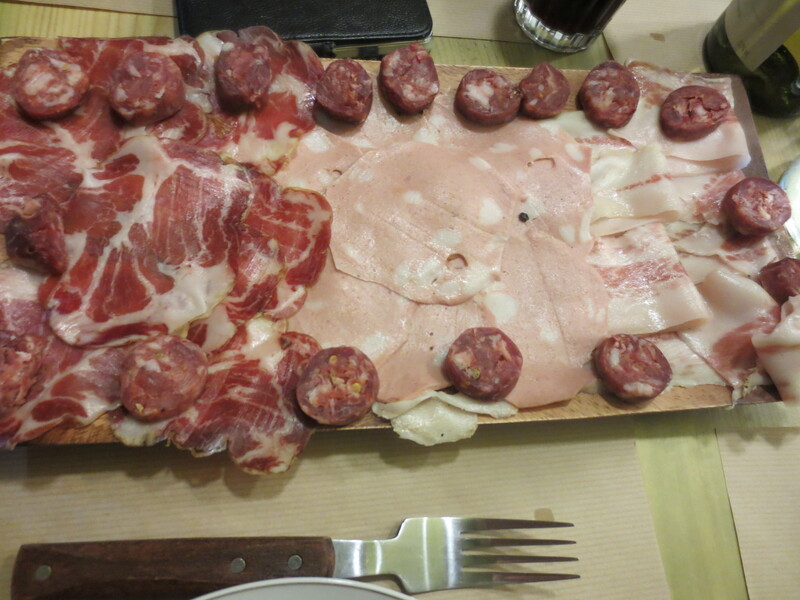 There were three pizzas to come next – Diavola, Capricciosa and Margherita – which were sliced by Igor with his large pizza slicer and laid in the middle of the table so we could have some of each. 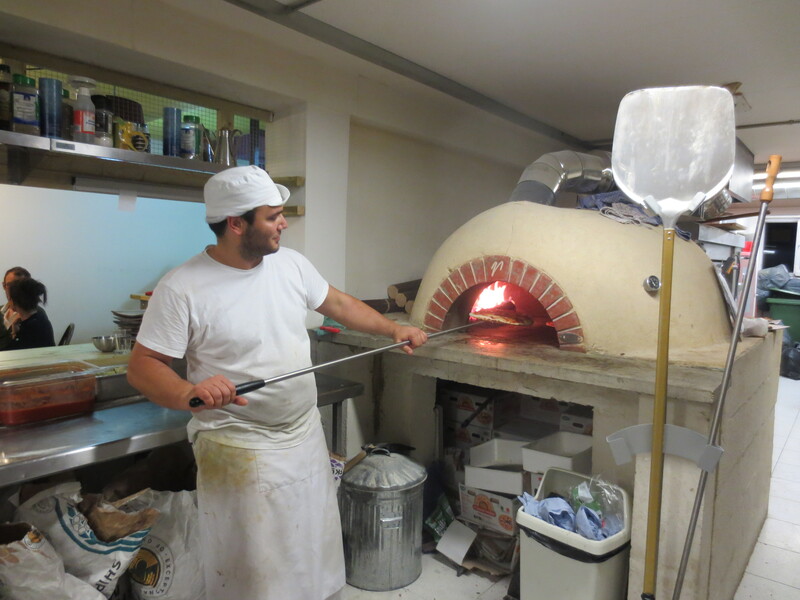 I moved over to the wood-fired pizza oven to watch pizzaiola Daniele in action. It was great to see his expertise in handling the large rounds of pizza, turning them in the oven to cook evenly and finally with a quick movement gather them onto his paddle and then let them glide onto the large wooden serving dishes. Expectations were high: Jonathan had said in his invitation to his guests that they were ‘awesome’ pizzas. Well, they are, and the whole party was highly impressed. North London friends joked that Ruben’s would now become their ‘local’ pizza place but their serious point was Ruben’s pizza is worth travelling for. 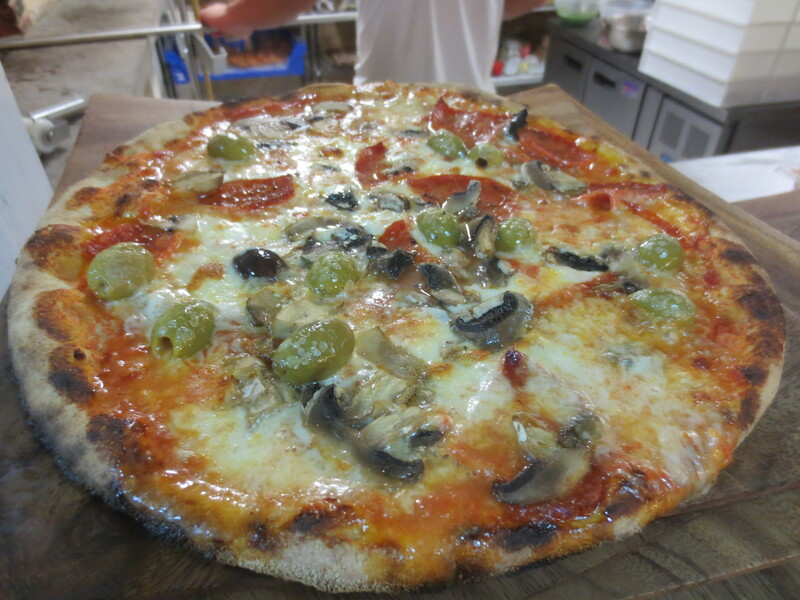 The toppings are great but what makes Igor’s pizzas so special is the wonderful sourdough base which is incredibly tasty. Everyone was having a great time. Igor put on some music. People starting wandering around, chatting, laughing. When dessert arrived hardly anyone was sitting where they’d started – but everyone sat again! Dessert was too good to miss. 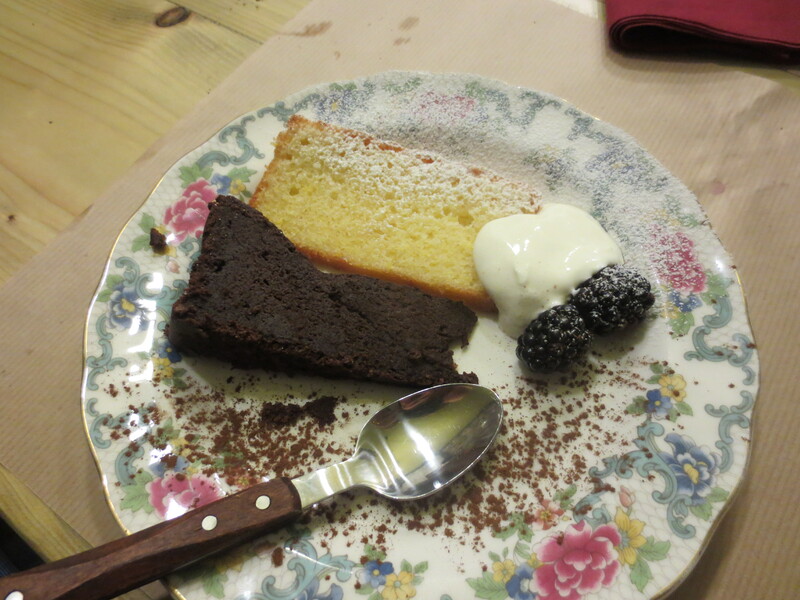 Slices of Pressed Chocolate Cake and an Orange Lemon Polenta Cake, served with blackberries and some creme fraiche were wonderful. What a fantastic way to end a really great meal. There was the option of coffee or mint tea to follow and in Italian mode I chose espresso. By the time everyone was ready to leave it was late … 11.30 to midnight. Ruben’s Refettorio was turning its attention to Ruben’s Bakehouse again. The bakers were arriving. Bread dough was being kneaded in a huge bowl with an enormous dough hook; dough was being shaped into baskets ready to prove. Jonathan thanked Igor and his team for putting on such a wonderful meal. The party guests said their goodbyes. We went out into the still warm air of the last day of August, about to tip into September. It had been a great day. Thanks Alice. It’s really is fantastic pizza! Thank you, Judy. It was excellent pizza. Congratulations to your son and the Mom! 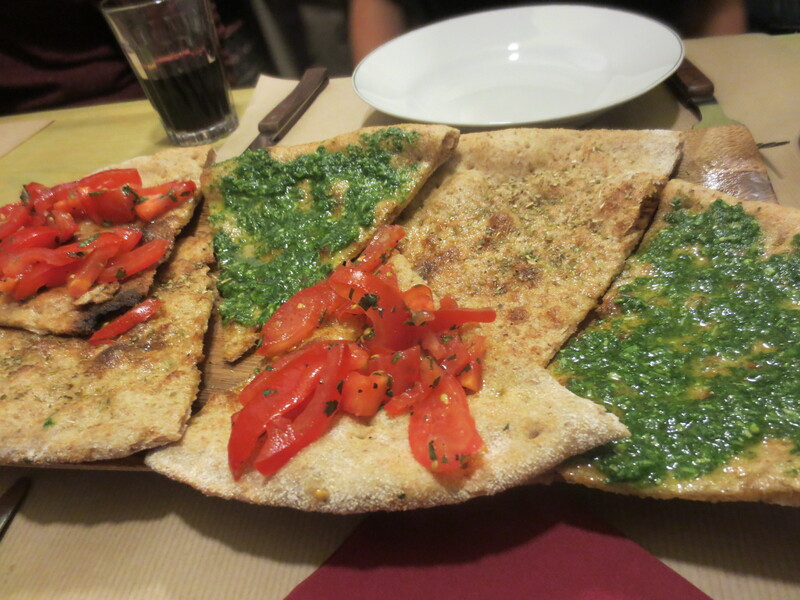 The pizza looks very good! Thank you Fae. Ruben’s pizza is wonderful.